Later this year, The Museum of Failure will open in Sweden. Those in public relations will notice the product flops it reportedly features, like Colgate beef lasagna, Harley Davidson perfume, and, of course, new Coke. But we like the museum for the lesson behind it, which is that even the biggest brands and most successful companies are capable of failure. It also inspired us to look at famous (and infamous) PR “fails” over the decades as examples that even big brands can mess up. Can You Head Off PR Failures? In PR a failure could be characterized as a campaign that never caught fire, a pitch that fizzled or a relationship that went badly off course. So, we can’t prevent them, and those day-to-day missteps probably prevent other, larger flops. When a truly whopping mistake happens, — well, sometimes it takes time and perspective. Consider these “historic” PR failures. The giant (melting) Snapple popsicle. NBC News called it “disaster on a stick.” And we’ll never forget it because the 2005 stunt by Snapple happened just a few blocks from our office. The 25-foot icepop caper was the brand’s attempt to break the Guinness record for the world’s largest popsicle in order to promote a new beverage flavor. It wasn’t a bad idea — visual stunts can be mediaworthy, and reaching for the record presumably gave the giant pop an extra reason for being. But the whole thing melted down as the brand tried and failed to have a crane lift the rapidly softening giant pop upright, and Snapple called off the stunt amid rivers of sticky pink water gushing down 17th Street. The Snapple ice pop will live in PR infamy, yet it probably raised more awareness of the brand (and arguably for its new flavor) than an ordinary event would have. It could have been a simple product mistake; Urban Outfitters launched a short-lived tapestry featuring gray stripes and a pink star that many thought was reminiscent of the striped pajamas that concentration camp prisoners were forced to wear during the Holocaust. We tend to think the retailer was being intentionally provocative, given its history of controversial products (see: Kent State splattered sweatshirt), so we give it a failing grade on this one. Unfortunately, Urban Outfitters isn’t the only retailer to launch a product that reminded some of Nazi Germany. Zara was forced to pull a yellow-star-emblazoned striped t-shirt off the market after similar concerns were expressed by the Anti-Defamation league. The commonsense lesson: stay far away from Hitler references or holocaust imagery, unless you want to be seen as exploiting a historic tragedy to make a sale. The “Iron Man 3” fake attack. Compared to the giant ice pop, this one was just a local promotion, but it was far more alarming. Only a year after the Aurora, Colorado movie theater shooting that killed 12 people, a Missouri theater owner staged a fake attack to promote a screening of “Iron Man 3.” He sent a costumed character carrying a fake gun into the theater, prompting several audience members to call the cops. Luckily, no shots were fired, but the performance may go down as the stupidest — and most dangerous – PR stunt in history. The storm set off by a flippant tweet from a young PR executive three years ago seems a lot less shocking in the age of Trump. But Sacco’s experience was an object lesson in how ruthless the social mob can be, and how quickly things can turn when you don’t, or can’t, address a mistake right away. Just before leaving on a flight to her native South Africa for Christmas in 2013, Sacco, a smart and presumably social-media-savvy employee of IAC, posted a racially-charged tweet about AIDS. It was an attempt at snarky humor, but when she landed 11 hours later, thousands of angry tweets greeted her, including one from her employer. Sacco lost her job, her reputation, and probably her personal bearings as she grappled with the consequences of that single tweet. Today, she’s a poster child for internet shaming, and her experience is a personal branding lesson that everyone should heed. This one had good intentions, and we give Starbucks points for its 2015 initiative designed not to promote a new drink, but to start an important national conversation. The idea was for Starbucks baristas to write “Race Together” on cups and to actually engage customers in a dialogue about race relations. Even beyond the practical considerations (who has time to start a heavy conversation on their way to work? ), “Race Together” became late-night joke material and died a quick death. Yet, as Starbucks CEO Howard Schultz later explained, “The irony is, we did create a national conversation — not how we intended, but you learn from mistakes.” Well said. “Don’t let your failures define you–let them teach you.” Barack Obama said this, perhaps to Hillary Clinton, who has known some failure in life, or maybe just to anyone who has experienced a setback, which means everyone. Mistakes happen, and their lessons begin when we take responsibility for the part we own, then forgive ourselves. 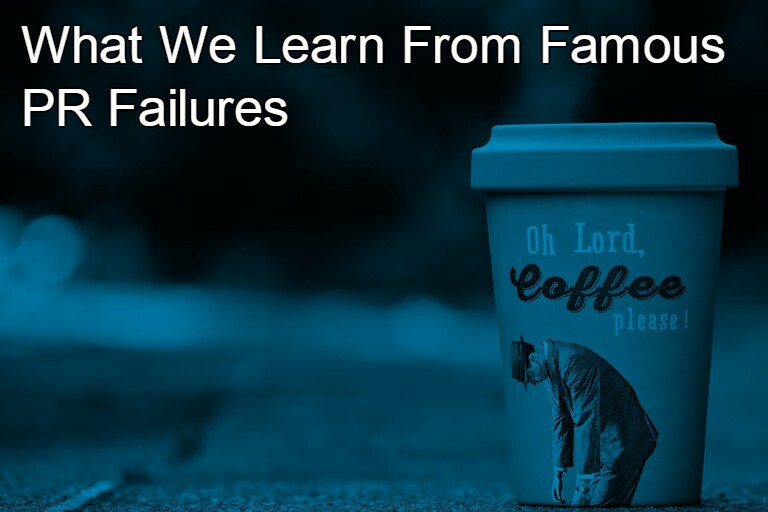 So, we should remember failures, because they keep us humble, honest, and hungry for success. I had a colleague who kept a hard copy of a very negative story from a past media relations campaign. She said she needed to know that despite her best efforts, things could still go south. It’s not an incentive that would work for me, but for her it was a reminder to do her best work. For most of us, that motivation just might be a walk down the halls of the Museum of Failure.